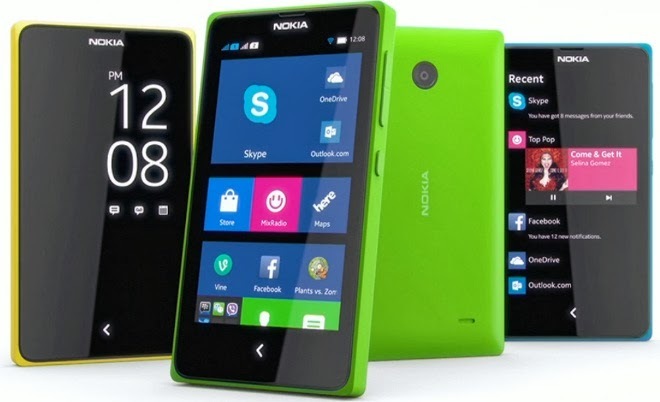 At Mobile Word Congress 2014 (MWC14), Nokia had officially announced its three new first-ever 'Android' operating system powered smartphones known as Nokia X+ Plus Smartphone, Nokia X Smartphone and Nokia XL Smartphone. In this article we are going to Review of Nokia X+ Plus 'Android' Smartphone Specifications, Features, Availability and Price details. Nokia X+ Plus is also a Dual SIM smartphone having technical hardware and software specification and features similar to Nokia X 'Android' Smartphone and the only difference between two smartphone is 768 MB RAM. Additionally, Nokia X+ Plus has Processor - 1GHz dual-core Qualcomm Snapdragon 8225, Display - 4.00-inch, 480x800 pixels, RAM - 768 MB, Storage - 4GB + SD Card support upto 32 GB, Front Camera - No, Battery - 1500 mAh, OS - Nokia X platform 1.0 based on AOSP 4.1.2, Rear Camera - 3-megapixel. Nokia X+ Plus is also a 3G certified smartphone and also come with Nokia apps like Here Maps for offline, turn-by-turn navigation and Nokia MixRadio. Nokia X+ Plus is running Android OS, v4.1.2 (Jelly Bean) mobile operating system but excluding Google services like Google Play Store etc. Nokia X+ Plus User Interface (UI) is somehow a mixture of Windows Phone UI and Android UI, so buyers can experience two different mobile OS UI i.e. Windows Phone and Android under single smartphone. You can watch full Nokia X+ Plus official video review. 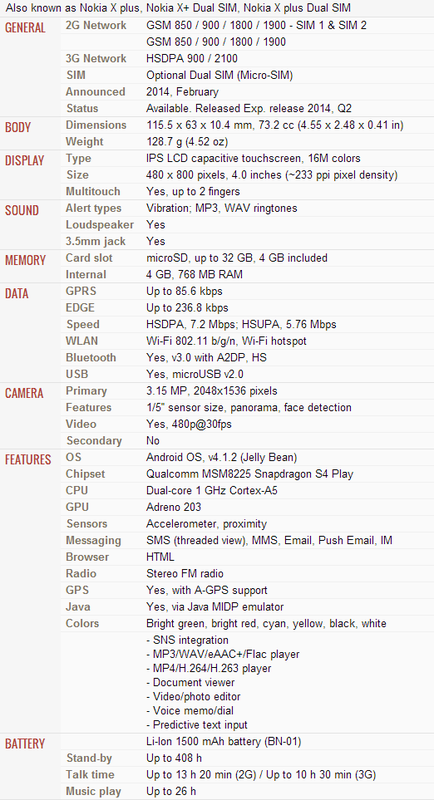 You can read full Nokia X+ Plus specification and features. The official release date of Nokia X+ Plus is Q2 2014 and the official price of Nokia X+ Plus is approx. €99 Euros Or $136 Dollars and it’s officially available to buyers worldwide including Asian developing markets such Pakistan, India etc.